If You Don’t Like Pit Bulls, Don’t Own Them? Two Lancaster, Pennsylvania, children are reportedly in serious but stable condition following a dog attack on Monday afternoon. The 66-pound pit bull terrier broke through a fence, jumped into the minivan, and attacked a 5-year-old boy and a 2-year-old girl—who were strapped in car seats at the time. Police told Lancaster Online that their mother and several Good Samaritans successfully got the dog away from the kids. Authorities said the minivan was parked behind their home when the attack occurred. Witnesses to the horrific ordeal claimed the boy was covered in blood. Another witness told WPMT that it was raining, which made it easier for the slippery dog to jump back on the boy several times and continue the attack. However, the dog’s owner secured their pet by the time officers arrived. The mother drove the children to Lancaster General Hospital but due to the severity of their injuries were transported to Hershey Medical Center, according to police. The mother, who police declined to identify, was treated for minor scratches. Lancaster Police Department Lt. Bill Hickey said the dog’s owner is currently cooperating with authorities. White and her 15-month-old, Jaikeem Hillard, were walking to visit family on a nice day when out of nowhere two pit bulls attacked on South Reber Street resulting in nerve damage in part of his face. “I tried. I tried to protect him. Basically I watched him getting attacked, but I couldn’t do nothing,” White recalls. After spending two weeks in Milwaukee at Children’s Hospital, Jaikeem is finally home in Green Bay. “He had like multiple staples in his head and stitches, and his ear was ripped out hanging by a piece of meat,” says White. Pit Bulls: Man’s Best Friend Or Deadly Weapon? To give you some idea, I once kept eight beagles in my back yard. When my wife complained, I’d tell her to choose which ones needed to go. It was a pure bluff: some were prize-winning field trial hounds, others house pets. However, they all had eager, loving hearts, and she knew all their names. But for all my foolhardy animal passions, I have never harbored a pit bull. Nor would I. Just as beagles are obsessed with tracking rabbits, pit bulls are preoccupied with fighting. It’s in their genes. They aren’t so much protective as simply belligerent. So here’s my story: three weeks ago, I was walking my two big dogs in a city park. Jessie and Maggie are a Great Pyrenees and a Great Pyrenees/Anatolian cross. Both are shepherd’s dogs historically bred to fight wolves. Weighing roughly 120 pounds, mine spent their first eight years guarding our farm against coyotes and cow-chasing dogs. Mostly they guarded cats, of which they’re fond, and farm animals generally. Jesse appears to think he’s the king/boss dog of the world, which in his quite limited experience, seems true. I once saw him pitch into two coyotes pestering my neighbor’s goats. He shook one, threw it, and then started after the second, which took off at warp speed while its companion skulked away. Then Jesse picked up a goat kid and carried it unharmed to the herd. Another time, he protected my wife from a charging mama cow. She wanted no part of him. Nobody taught him these things; they’re what Great Pyrenees do. Jesse’s consort Maggie fears just one thing: him. Otherwise, she’s equally powerful and more aggressive. Maggie simply will not abide a challenge. It’s the Anatolian in her, a Turkish breed inclined to be territorial. When they were younger, they spent a lot of time play-fighting—perfecting their moves. People they like in their aloof way; children, they love. Even so, everything else being equal, I wouldn’t keep these dogs in the city. But I couldn’t abandon them after nine years, and they’ve adjusted. Our backyard fence is impregnable, the gates padlocked shut. We walk several miles together every day. Maggie needed some persuading that dogs we encounter aren’t looking for trouble, but she’s intelligent and I’m large enough to restrain them, so all is well. So there we were in Allsopp Park near the end of our outing. As we passed a playground crowded with small children on a sunny afternoon, I saw a large pit bull, unleashed and dead-heading toward us with unmistakably aggressive intent. I called for somebody to control him. But nobody there owned him, so nobody acted. There were no preliminaries. The pit launched directly for Maggie’s throat. Wrong move. He got nothing but a mouthful of thick fur. In a flash, she’d seized his ear in her jaws, thrown her leg over, and pinned the crazy SOB to the ground. No way was she going to let him get back up. Jesse tore into his hamstring. A sane dog would have surrendered. But this was a pit bull. Ordinarily, I could have pulled my dogs away. But not with a furious death grip on an 80 pound dog. I was afraid they were going to maim or kill him in front of the children and their mothers. Luckily, one fellow took Jesse’s leash and tried to pull him away as I tugged Maggie in the opposite direction. Another young father grabbed the pit’s collar and lifted him off the ground without getting bitten — above and beyond the call of duty. A third guy produced a leash, and led the dog away with its terrified owner, a girl about twelve who’d left the front door open and had been chasing her dog across the park. Maggie’s face was covered in blood, none of it hers. Disaster had been averted. My dogs were excited and happy: Is it supper time yet? But what if I’d been walking dachshunds or cocker spaniels? What if nobody was there to help? It wasn’t the poor girl’s fault, the blame lay with whoever left a child alone with a deadly weapon. Possibly this breed has a place in today’s world, although I can’t think what it is. Like smoking or riding a motorcycle without a helmet, owning a pit bull should be seen as anti-social and stupid. It wouldn’t trouble me if it were illegal. SAN ANTONIO — For the second time this year, an elderly woman has died at University Hospital after a dog attack. Petra Aguirre, 83, was attacked by a neighbor’s dog in her backyard on the West Side last month and died Friday evening at the hospital. She had bites all over her body, according to officials and her family. He was outside playing and riding his bike when his bike chain fell off. He went in to tell his Daddy and he told him don’t go out of the yard they were about to leave around 4pm,then went back out to wait for it to get fixed on the porch. Suddenly an 80-100 lb, 8-month old, pit bull entered the yard and attacked him, unprovoked. The dog continued to bite, eat and drag little John all the way across the yard, over 20″ from the spot he first attacked. Bradley, John’s older brother, was horrified as he was riding his bike home from a friends house at that moment and saw what he thought was a dummy with red hair being dragged by a dog. He quickly realized it was his little brother and ran toward them, kicking at the dog, it raises up and growled then continued to drag John, it wouldn’t stop. Little John was still crying for help as Bradley ran inside to get their Daddy. He said he kicked the door in screaming, the kitchen stove fan was running so he had to kick the bedroom door in. He jumped from bed,Their Daddy ran out yelled and yelled which caused the dog to step back and prepare to charge him. As the dog stepped back, their Daddy was able to shoot the at the dog 16 rounds hitting him three times. One directly in the forehead grazing him cause he moved, one in the ear and one in the leg that finally caused him to drop long enough to grab John and put him in the truck. By that time he couldn’t speak but was still breathing and responding with his one eye he had left. 911 was called in by the owners dog saying the neighbor just shot his kid. They got little Johns body and put him in the car to rush to the hospital. Daddy had to hold what was left of his face on. Little John was still alive as Daddy and Bradley were talking to him, telling him to “Hold on Buddy”. They rushed him to the hospital and arrived before the first responders even arrived at the residence. The emergency medical team worked on saving Little John for 45 minutes as Bradley and daddy watched until they were forced out,when he coded and they had to shock him, into another room. His wounds were too severe and we lost our angel. He had over 50 puncture wounds to his head neck arms and what was left of his face. The attacking Pit Bull had been caged and no one even knew it existed in the neighborhood is what I was being told. Klonda Richey, 57-years old, was brutally attacked, stripped naked and killed by her neighbors two dogs in front of her home. Her death was “very traumatic, and very painful,” according to the Montgomery County Coroner’s Office. Dayton Police shot and killed both dogs on scene and reported the dogs were pit bulls. SAN ANTONIO — Betty Clark was delivering Christmas presents to her Canyon Lake neighbors Dec. 21 when she was attacked by two dogs from the neighborhood. The 75-year-old widow was found unresponsive, bites all over her body. She died about two weeks later at University Hospital, never having regained consciousness. HOUSTON – Authorities have identified the woman Monday killed in a vicious mauling by a pack of pit bull dogs over the weekend in southeast Houston. According to the Harris County Medical Examiner’s Office, Christina Bell Burleson, 43, died after she and two more people were attacked early Sunday. Her last known address was at the Servants of Christ United Methodist Church in southeast Houston. That’s because she and her husband are homeless. Burleson had been a member of the parish for nearly ten years and volunteered for its Crossroads Outreach program for the homeless. The owner of a dog that attacked a woman and her own dog while jogging Wednesday in Ambridge has been arrested. Police said Shannon Garveys was hospitalized after she was attacked by a dog while she was jogging on 14th Street in her Ambridge neighborhood with her dog, Sport. “He jumped me (and) bit into my shoulder. I fell to the ground. He pulled me into the mulch,” she said. Garveys spent Wednesday night in surgery. She said the dog bit down to her shoulder bone, tearing tendons and muscles. “Thank God I carry a weapon. I had a knife and I just started stabbing him,” she said. Garveys said she and her dog were both attacked, and the owner saw the attack and never helped. “She looked at me and said, ‘You can’t do anything to me. You can sue. I have no money,’” Garveys said. The dog’s owner, Jennifer Krummert, was arrested Friday. Ambridge police said she was known from previous incidents involving her dogs. “I’m mortified by what happened,” Krummert told Channel 11 News. She claims that she helped Garveys. “Yes I did. Ask the cops. I’m the one who held the towel on her,” Krummert said. However, police said that wasn’t the case. Krummert was on probation after the same dog attacked a man last year, according to police. The victim had to get on top of a car to get away from the dog. Police said Krummert was supposed to keep her dogs muzzled and leashed if they were outside, but that didn’t happen. CINCINNATI (CNN) — Officials in Cincinnati are investigating after two pit bulls ran into a Family Dollar store Sunday and cornered a woman with her two-month-old baby. Callaway, FL – Tyler Jett, 7-years old, of Callaway has died. On April 2, Tyler was savagely attacked by two loose pit bull-mix dogs. Tyler was flown to Sacred Heart Hospital in Pensacola where he remained in intensive care until his death. The boy suffered a punctured carotid artery and his head, face and neck were badly bitten. The dogs’ owner, Edward Daniels II, was charged with felony tampering of evidence after washing the blood off one of his dogs after the attack. Two dogs attacked a 67-year-old woman in Odessa while she was doing yard work. It was the help of a fast-acting neighbor that saved her life. News West 9 reports that the incident occurred last week on the 700 block of South Lee. Juanita Rodriguez was mowing her lawn when two neighborhood dogs launched anattack on her. Neighbor Louis Garza was outside when the commotion broke out. He said he initially thought nothing of it until he heard screaming. “She was hysterical. She was panicking. She was holding her chin because it seemed like something was hanging. She was just gushing blood,” said Garza. While the two dogs were attacking the woman, Garza jumped over his fence and successfully chased the pit bulls away by yelling and charging at them. As for Rodriguez’s condition, she’s been in the hospital and is reportedly going through her second of many surgeries. The victim’s son, Sam Rodriguez, tells the news station that it’s going to be a “process” to get his mother healed after the mauling. LELAND, NC (WWAY) — One Leland woman said she’s been scared to go out in her yard because of a neighbor’s pit bull. Tuesday, Mary Diemer said that pit bull attacked and killed one of her cats. She said she fought the dog off with a plastic gardening shovel, but her cat Lupe was already dead. “I laid the cat down on the ground, and I could see her back legs. Her back was broken,” Diemer said. She said she called for help, and Brunswick County Animal Control responded. A Brunswick County Sheriff’s Office spokesperson confirmed animal control issued the dog’s owners two citations: one for running at large and one for public nuisance. The spokesperson said the dog was not aggressive toward people, and the owner was cooperative. Diemer said she’s called animal control before after seeing the pit bull jump the four-foot fence between yards. Her neighbor Rick West said he has seen the dog jump his fence as well. That is a concern Diemer, a grandparent of a six-year-old boy, has. “I’m afraid for him to be out here in this yard by himself,” Diemer said. The spokesperson said animal control officers are still investigating what happened. 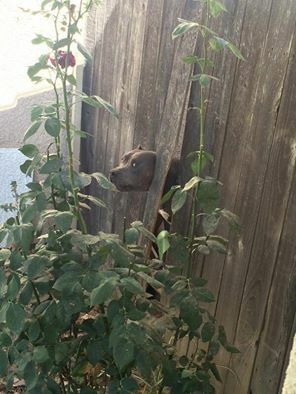 They said investigators have to determine if the dog is ‘dangerous’. If the dog is found to be dangerous and certain steps aren’t taken by the owners to keep the dog from any more dangerous encounters, authorities can petition the court for ownership of the dog. At that point it would be up to a judge to decide on what happens next. This entry was posted in Frequently Updated Blog Posts and tagged Don't own them?, If You Don't Like Pit Bulls, menace, neighbor's pit bulls, pit bull attacks. Bookmark the permalink. The title of your article is very interesting. I want to write my answer to that statement at my own newsletter, since my answer wound up being quite a long answer. I hope that you and others read it when you and others have time. Thank you.